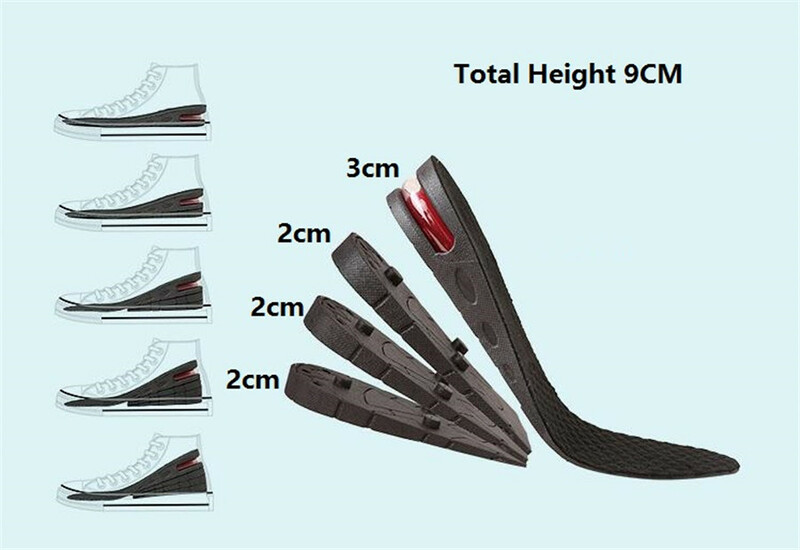 Height Increase Insole Instantly increases your height. Layers can be used individually or as a combination. Removable sole lets you choose your desired height, Discreet- no one will know you're wearing them. Perfect for a night out, special events, meetings, weddings, or any event where there is a camera lurking about. Featured air cushion function, makes them comfortable to wear. CHOOSING HEIGHT FREELY - These incredible foot insoles allow you to increase your height by up to 3cm, 5cm,7cm or 9cm in just a blink. 2 different options :3 Layers/2.75 inches, 4 Layers/3.54 inches to let you choose your desired number of layers and height! SUPERIOR QUALITY AND ODOR FREE - The superior quality insoles are made up of a material PU that feels good on your feet and prevents the growth of odor-causing bacteria - thus keeping your feet always fresh and odor-free. The insoles can be quickly and easily cleaned to maintain a good level of hygiene. UNIVERSAL DESIGN - These come in a pair of 2, for left and right foot. The insoles can fit equally well in both men's and women's footwear and can be easily removed when you do not want to use them. Fit your sports shoes, formal or casual shoes, you can insert these in almost all types and look remarkably taller. The best part is, these elevator heels remain concealed, such that no one ever knows the secret behind your increased height. SHOCK ABSORPTION, COMFORTABLE, REDUCE PRESSURE - Removable U shaped air cushioned caps which give maximum comfort to your heels and let you feel relaxed all day long. The maximum thickness is also limited to an optimum value just to ensure that it doesn't make your shoes too tight.